Which is appropriate for a flash drive? I know the first one (GUID Partition Map) is for booting modern Macs. Booting is not an issue for my use of this flash drive. The second one (Master Boot Record) is old, from the 80's DOS 2, for old PCs. Why is this offered as a scheme for "Mac OS Extended (Journaled)"? That really threw me, and prompted this Question. The third one (Apple Partition Map) is for booting old Macs (68K and PowerPC rather than Intel chips). No matter what Scheme I choose, I get an error when trying to format the item higher in the hierarchy in the sidebar to the left (Lexar USB Flash…), as shown in the screen shot above. Why? If I select the secondary item in that list (Lexar), I can successfully do a format operation. But the "Scheme" popup menu does not appear in the panel. What is the difference between the two items in hierarchy? Does it make sense that I cannot choose a Scheme on the secondary one? In virtually all cases, you want GUID Partition Map. Only choose a different scheme if you have specific needs that require that scheme. GUID Partition Map provides the best compatibility and is the most current scheme. Without knowing what the error is, I can't say why you're unable to erase the disk. The top level item is the disk itself, whereas the lower level items are partitions. When erasing a specific partition, you're only changing that partition, not the whole disk. Since the scheme is for the entire disk and not one partition, it doesn't make sense to have the scheme show for a partition. Sadly, Disk Utility has been made progressively worse in recent versions of the Mac OS (macOS or OS X or whatever). Usually, as mentioned already, the correct scheme is GUID. You only need MBR if you will be talking to the drive using older versions of Windows (XP and earlier if I remember correctly), and only need the old Apple scheme when using early versions of Mac OS (pre-OS X?). 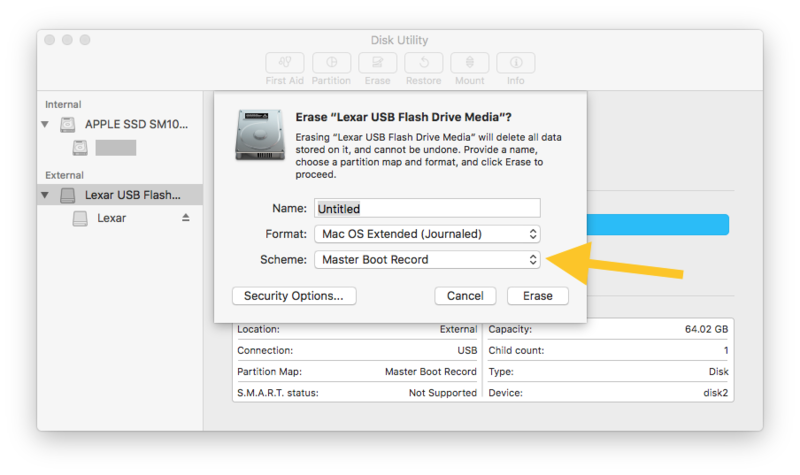 However, regarding your inability to format the 'drive' rather than the 'partition', try selecting the partition button along the top of Disk Utility. That should allow you to create a partition on the drive and set the partition scheme. Then select the partition on the left hand side and format it using the filesystem of your choice. It might be a permission issue. I had a flash drive I tried to format on my dad's MacBook and I had the same problem — it wouldn't let me erase or format the partition. When I got home and put it back in my Mac mini I was able to format it without any issues. Not the answer you're looking for? Browse other questions tagged macos mac partition disk-format flash-memory .